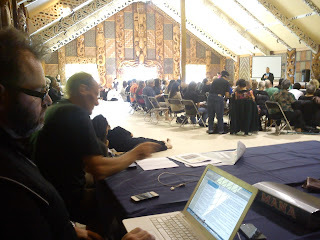 At the MANA AGM this morning at Tokoroa. 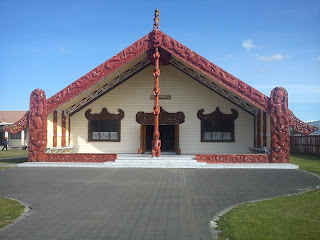 Beautiful wharenui. 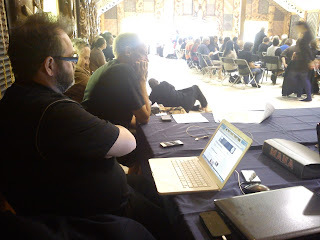 Tumeke blogger emeritus, Mr Bradbury, is seated to my left at the media table. Keen members absorbing the party paperwork at the moment. Annette Sykes is presiding. Hone's keynote speech is expected at 12:30pm. President, Annette Sykes, says be prepared for protest action in Waikato against MRP privatisation before the government's May budget. 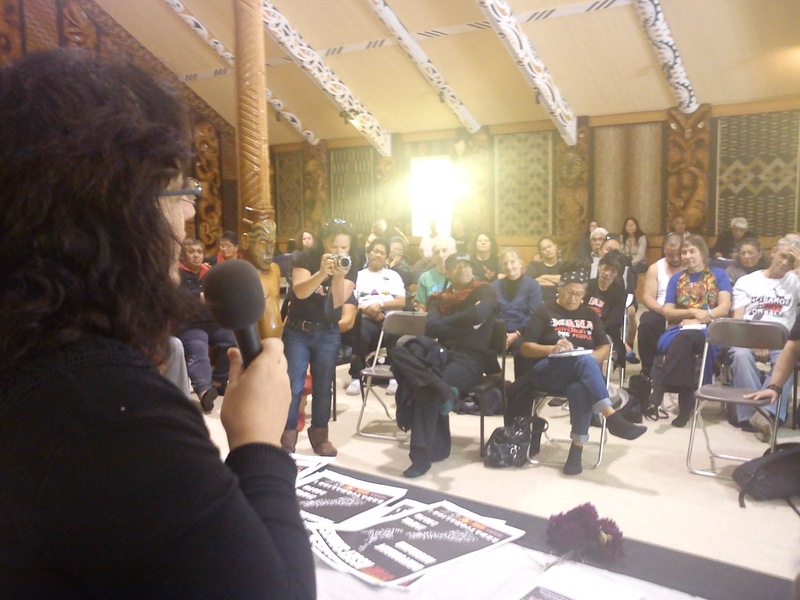 Rangatahi group presents ambitious flaxroots programme of engagement. Rohe reps giving reports. Branches seem quite active. Approx. 120+ in attendence. Did the speaker just say we should support the Taliban!? Sharp intake of breath... Oh, she meant 'Talley Ban' - a ban on the Talley's businesses... Phew! 'Bomber, Bomber' the chant goes up from the floor. Mr Bradbury is being put on the spot. Greatly appreciated impromtu report. 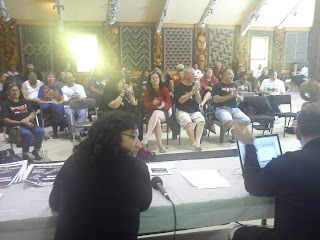 Greatly appreciated didn't join in the waiata. Hui over. Realise missed remit part earlier in morning and that Hone's remarks earlier was his address. He had changed it to take advantage of the media there. Was too busy taking pictures etc. to recall, except perhaps the news that John Minto (Mana male VP) is thinking of running under Mana banner for Mayor of Auckland. The Feed the Kids symposium was held the previous day and was well attended from what I heard. The movement appears to be in a fairly bouyant mood despite being right at the trough of the electoral cycle. All rohe of the organisation were present incl. Sydney braaanch, and the Youth wing. I missed Matt McCarten's speech too, I understand he may be pushing for the same sort of focus that happened with the Maori Party when they ran candidates in the general electorates in their first election. It bled scarce resources away from the key Maori seats, so they just ran in the Maori seats thereafter. 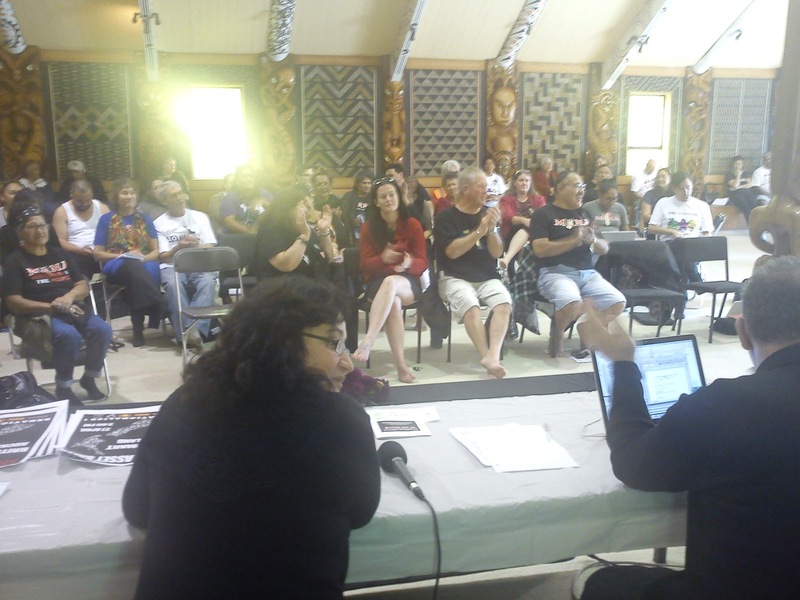 I'm not so sure a party of the people, such as Mana, could ever abandon an entire electoral division - and the biggest by far - and still hold the narrative of a people's movement, Mana tangata katoa. It may be rational on one level to specialise and target to your strengths, but waving the flag is an important task that must have some value and a positive electoral outcome. I'll have to find the data on this. Overall good vibe - as always. It is a privilege to be in the same waka as some real, old school, veteran activists. Never thought I'd being saying that about Lefties with a Das Capital L, but that's what you get when the alternatives are instruments and apologists for a corrupted, colonialist, crony-capitalist regime.